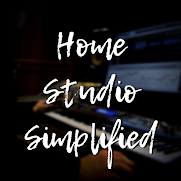 Home Studio Simplified: Mixing Day! Well Thursday proved to be eventful! I finished refurbishing two more guitars and did A LOT of mixing! Most of the songs were already close to being done, but I decided in order to keep the creative flow going for the new album (In Pursuit), that I would get them close but not stress over the small stuff. Then on Thursday I would do a batch mix of all that I had up to this point. It actually worked out pretty good. I was a little sidetracked on more than one occasion (crawling under the mother-in-laws house to remove a skunk, repairing the toiliet in our bathroom, honey do lists,etc.) but somehow I managed to get quite a bit done. For those of you who have been following the podcasts (itunes & rss feed is on the sidebar if not) you might know that I haven't uploaded an episode in awhile. Unfortunately, I reached my data cap and have had to wait until the next month. However, soon and very soon, I will be releasing a new podcast episode where I will be covering my “batch mixing” process and I will also be rolling out some great new, and I must say, exciting things. If you have listened to the podcasts and you have any episode ideas, let me know! Also, please remember to rate it and leave a review, this will help others to find all that rambling as well! Well, gonna get back to song #6 I believe it is now... Whew! Just thought I’d take a break and give my ears a rest. What are you doing with your music right now? I'd like to hear your thoughts on “batch mixing!